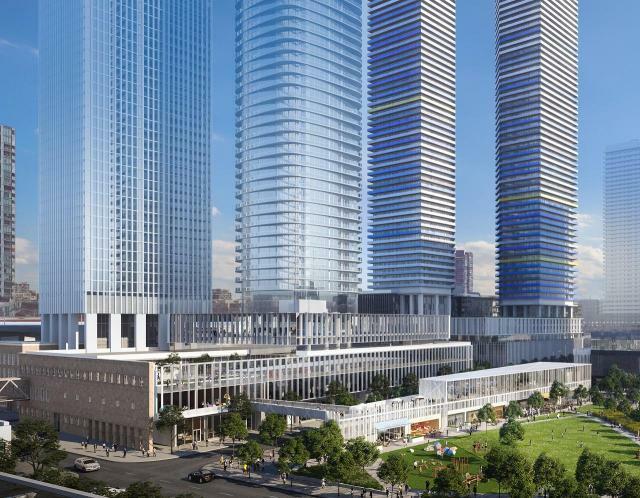 64 and 70-storey architectsAlliance-designed residential towers are proposed to rise on the northeast quadrant of the LCBO Lands on Queens Quay Boulevard East in Toronto's Lower Yonge Precinct Area. The Menkes development will include a new LCBO headquarters office tower to the south, a park to the southwest, and more condominiums and a public school to the west. The complex will be tied together through an extension to Toronto's PATH system.